Easter in France is a particularly enjoyable feast. To some it has enormous religious significance; for many others it's the time to shake off winter and enjoy the feeling that spring is beginning. 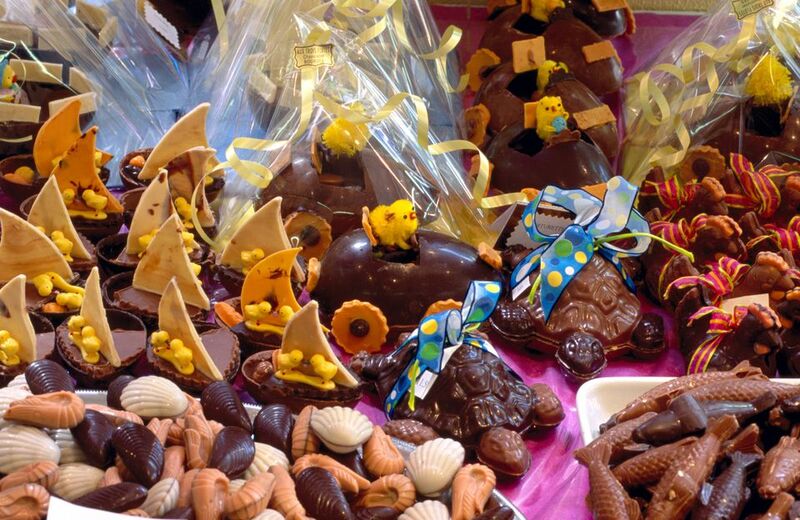 Chocolate treats, good food, holidays and special events make a French Easter special. Pâcques (French for Easter) comes from the Latin word pascua, a Greek transliteration of the Hebrew word denoting the Passover feast. In Jewish tradition, the Passover deals with the Exodus from Egypt, while the Christian tradition celebrates the Last Supper of Christ before the crucifixion and resurrection. But like so many of our traditions, the origins go way back to pagan times which means that our Easter now coincides with the awakening of the earth from its winter sleep and fertility rites. Carnival, running from mid January to just before Easter, has also become part of the equation. Carnivals are mainly celebrated in catholic countries, with a particularly strong tradition in France. Easter is celebrated throughout France with Easter Monday (Lundi de Pâcques) being a public holiday. On Easter Sunday church bells are rung wherever there are steeples and towers full of those glorious clanging bells. The old idea (and one which children adore up to a certain age) is that the bells are coming back from Rome to deliver their eggs on Easter morning. If you're in Paris, make your way to the American Church or the American Cathedral where you'll find fellow Americans there to celebrate Easter. One universal tradition is found everywhere where Easter is celebrated: children on Easter egg hunts. But as France has a multi-layered history, so different French regions have different traditions. If you’ve spent Easter in one region, don’t expect the same celebrations in other parts. Two regions that are particularly exciting at this time of year are Alsace in the east, and Languedoc-Roussillon in the south, an area which being so close to Spain follows many Catalan traditions. Easter markets take place over the Easter weekend on the two historic squares of Colmar: the Place de l'Ancienne-Douane, and the Place des Dominicans, both of which were important meeting places in the Middle Ages. There are stalls and shows, food and drink and a children’s section with animals and birds. Throughout the weekend you’ll find music in cafes, jazz in bars and concerts everywhere. On Saturday in the Parc du Champ de Mars from 2pm to 5pm there’s a children’s egg hunt (2.50 euros per person). While you're here, make sure you see the extraordinary Issenheim Altarpiece which is one of the world's great religious art works. The Procession of the Sanch is one of those ceremonies that was taken over by the Christian church. Taking place on Good Friday in Perpignan, the long procession of figures, clothed in long black robes with distinctive peaked hoods covering their faces and led by a figure in red, winds through the streets to the beating of tambourines. The figures belong to the brotherhood of La Sanch (the blood) which was founded in the early 15th century by Vincent Ferries at the church of St. Jacques in Perpignan. The original purpose of accompanying condemned prisoners to their execution (hidden by the robes to prevent them being killed by their victims), became mixed with the procession of Christ to his crucifixion. Today’s processions, commemorating the Passion and Agony of Christ now has penitents carrying crosses and religious statues and it makes a pretty impressive, rather sinister event. Night processions also take place at Collioure on the fabulous Cote Vermeille (one of France's Most Beautiful Villages), and Arles-sur-Tech. Lamb is the traditional main dish on Easter Sunday, either a gigot d’agneau (rack of lamb), brochettes d’agneau (lamb kebabs) or navarin (casseroled lamb). In some parts of France, particularly in the south, omelettes also form part of the celebrations. Chocolate is an integral part of Easter and different chocolate shapes fill the windows of the patisseries throughout France. Covered in gold foil, or beautifully decorated, you’ll find eggs as well as elaborate bells, hens, bunnies and fish, called fritures (fried whitebait) and packed into staw baskets or boxes. While the big chains produce good chocolate, you need to seek out the true artisans of the art for the real experience. Here are just a very few of the many throughout France. If you feel adventurous, seek out Flavigny-sur-Ozerain in Burgundy where Chocolat was filmed starring Juliette Binoche and Johnny Depp.